Sundar Pichai at the Google I/O 2018 showed off one of the upcoming features of the Google Assistant. The CEO in this digital marketing event demonstrated how their AI-based voice assistant would be able to place a phone appointment on behalf of a user. 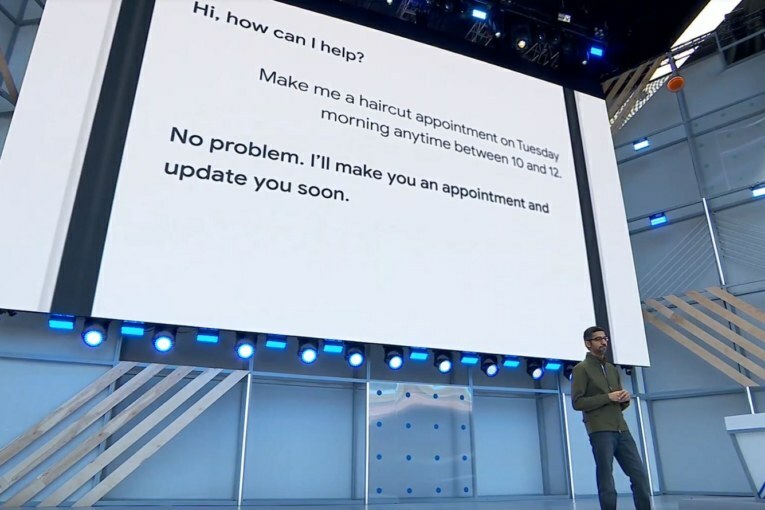 Pichai showcased a pre-recorded call on-stage that Google Assistant made to a hair salon to book an appointment. The conversation was seamless, perfectly timed, and sounded natural on the AI’s part. Pichai said that entire call was genuine and not staged at all. The AI interpreted all queries from the hair salon executive and responded back with relevant answers without any delay. The hair salon personnel never realised the voice on the other end was a robot and not a real human. This AI even threw a friendly “mm-hmm” when the other person asked for a few seconds for checking an appointment time. Google calls this technology Duplex; it defines it in their official blog as a technology that can be used to carry out “real-world” tasks over the phone with natural conversations. Duplex can be used specifically for scheduling appointments without letting the person on the other end know that it is an AI on the phone. The company says that Duplex is trained in closed domains as they are narrow enough to be explored extensively. The blog also mentions that this technology will not be able to take part in general conversations. Although this company has been developing this technology for years, as of now, it is still under development according to Pichai. He did not disclose when this technology will be available to the public but added that testers would get to experiment with it in the upcoming weeks. Pichai says that the primary objective of this technology is to address the need to communicate for people that don’t have time to make appointments. It would also help those busy parents that want to schedule a doctor’s appointment for their ailing child. Other than that, Google also wants to use this technology to contact businesses and update their timings and when they remain open in Google Maps. Google Duplex will also be able to maneuver through conversations that become diverted from their primary intentions. Google assures that they would be transparent about the application of Duplex as such a natural-sounding voice can develop controversies. In addition to Google Duplex, Pichai also introduced a couple of other technologies in this digital marketing event. These included new features in the Google Photos app where it would automatically detect the persons in a photo and suggest the user share it with them. The app can also recognise underexposed photos and offer a one-click solution to correct its brightness. The app can also convert photos of documents into PDF and colorize black and white photos as well. Another technology was Smart Compose in Gmail, which would suggest sentences automatically while writing an email. Although Duplex stole the show, this event was a major digital marketing hit for Google. Previous : Eureka! Insta’s new messaging feature rolls out unique digital marketing play-off!